Committed to keeping its local roots, Blue Moon Brewing Co. moved into their new brewery into the River North Art District (RiNo) in Denver Colorado. Blue Moon wanted to make a positive, lasting difference in its new neighborhood, where some residents felt hesitant to welcome the brewery. Blue Moon began brewing in Denver, Colorado in 1995. Its home, The Sandlot Brewery, was located in the basement of Coors Field, and focused on brewing creative craft beers for game attendees. Creative inspiration and quality ingredients have been the foundation for every Blue Moon brew since inception. More than two decades after its debut, Blue Moon outgrew The Sandlot Brewery. Committed to keeping its local roots, the brewery moved into a 30,000 square-foot home of its own in RiNo. Some residents of the RiNo area were displeased with the change in their neighborhood and felt apprehensive about welcoming Blue Moon into their thriving, artistic community. Blue Moon wanted to make a lasting difference in its new neighborhood to showcase their commitment to embracing the creativity see throughout the district. Etched was selected to develop a campaign to support the brewery with this initiative. Etched aimed to execute an integrated campaign that would inspire creativity to create a long-lasting impact on the community. We knew that to be effective, the campaign had to have results that would be seen and remembered for a long time. Etched took an active problem-solving approach. In addition to providing community support, the execution aligned the brand promise of ‘creative inspiration,’ inspired by Blue Moon’s artfully crafted drinks. Etched executed an integrated campaign to enhance the client’s brand value and image with a creative project. Idea-exchanges led by Etched uncovered insight that an underpass that serves as major neighborhood connector was unlit and poorly maintained, making the area unsafe. We listened to the community’s concerns and used that as a jumping off point. Etched developed “Mosaics for Change,” a local effort to encourage collective involvement in championing creativity to make a lasting impact. By becoming part of something larger – a mosaic – participants are not only a visual symbol of a better community, they are actively creating a better place. They are showing that by working together, we all can drive change for the greater good. Etched execution included community outreach, media relations, non-profit partnerships, social media amplification, and experiential engagement via a hands-on service project. The brewery partnered with RiNo to unite non-profits for the effort. We determined “Mosaics for Change” would anchor on a mural project to beautify the underpass, and provide the lighting needed to increase safety for pedestrians and drivers. Muralist Pat Milbery and volunteers gathered on Dec. 3, 2016 to create a mural reflective of the vibrant RiNo community in a once unsightly space. The final touch on the underpass mural was a geometric lighting piece, so that pedestrians and cyclists feel safer when traversing the underpass. Artist Knomad installed a lighting piece this year. Both the artists commissioned are well-respected in the community, and aligned Blue Moon with them supported Etched’s mission to enhance brand image and value. Following the mural painting, volunteers, Blue Moon and RiNo collaborators, and Denver City Councilman Albus Brooks gathered at the Blue Moon brewery to celebrate the day’s work. With this in mind, Etched crafted creative messaging to align with the progressive, creative thinking seen in the RiNo district while also staying true to the Blue Moon brand. We wanted to make sure the community felt included in the mural project and empowered to join the volunteer effort. Emails and website copy were crafted with this perspective in mind. The invitations sent to residents were a call to action to “pick up your paintbrushes, channel your creativity, and change your community.” The stencil and flier designs incorporated the Blue Moon colors and the RiNo logo into a simplistic and captivating design. Media pitches and communication was also tailored, with an understanding of each reporter’s style and outlet type in mind. While Blue Moon is known for its artfully crafted beers, the objective of this campaign was not a simple sales ploy. Blue Moon wanted to enhance its brand image as a company dedicated to improving their community. The objectives were to position the brewery positively in its new neighborhood, raise awareness about its commitment to the district, and drive constructive community collaboration. Etched designed a program that would meet RiNo residents on their own terms and champion the power of creativity to transform communities. The topline goals of the campaign were to recruit volunteers, support local artists, drive media coverage, promote the social media charity effort, and engage Blue Moon employee participation. The intended impact was to forage a positive relationship between residents and present Blue Moon as a good neighbor and ethically responsible company. The desired effect for the organization was to elevate brand image and reputation. One of the main challenges of the Blue Moon project was changing the public’s overall perception of the brewery. Some residents were unwelcoming to the brewery’s relocation into the RiNo neighborhood. The Etched team also worked in a short timeframe to create, plan, and execute the project. To address these challenges, Etched worked swiftly to implement the following strategies and tactics. Community Outreach and Partnerships: To drive awareness to engage and encourage local nonprofits, residents, and campaign leaders to participate as volunteers. Etched, Blue Moon, and RiNo worked in collaboration to ensure cohesiveness and community involvement. The agency created an Eventbrite RSVP rage and website copy that would incite community members to sign up as volunteers. Employee Engagement: To ensure Blue Moon employees support and embrace the effort internally, so they could properly represent it to the community and customers in the Blue Moon brewery and restaurant. Emails and invitations were crafted to encourage employee participation and attendance to a post-event celebration at the brewery. Media Relations: To garner credible coverage to drive awareness before, during and following the service project to position the brewery. Individual, custom pitches were sent to relevant reporters across all news mediums. A news release was utilized to support pitches, but the key focus was on engaging specific reporters to secure original content coverage in high-profile outlets. News advisories were also written and sent to reporters. Interview and event speaking points were written for Blue Moon spokespersons to ensure preparedness for media opportunities. Media kits were prepared and distributed to reporters on the day of service. Influencer Relations: To leverage well-known residents to amplify the campaign via their social networks. Local artists, light designers and arts organizations were engaged to assist with design of the mural. Local artists Pat Milbery was Knomad were enlisted to infuse their creativity in the community project. Social Media Amplification: To stimulate social buzz and online conversations to generate awareness and word-of-mouth outreach. Etched developed personalized, authentic content for each influencer and participating organization to share via their social networks. The agency spent time analyzing each network to ensure content aligned with the tone and voice of the influencer or organization. The unique hashtag #SomethingsBrewingRiNo was utilized and encouraged. In addition to raising awareness, social media users were notified that every time the hashtag was accompanied with a post, $1 would be donated to a community art project. Creative Deliverables: To drive awareness of brand image and provide creative material for the client and volunteers. The Etched team created a stencil graphic, the volunteer t-shirt design, and support fliers adjusted for social sharing. On top of securing broadcast media clips, we also recorded a high-quality time-lapse video of the mural and an interview video with a local artist who assisted with the design of the painting. Blue Moon is a champion of using creativity to transform and improve communities. Blue Moon is a good neighbor and a responsible company that will dedicate their efforts to embracing their new home and enabling creative projects. RiNo residents, Blue Moon employees, local artists, and non-profit organizations can unify and collaborate for the benefit of the community. The intermediary effect of the campaign yielded great success in driving awareness. Public relations activity included content creation, traditional and social media engagement, influencer engagement, and event management. Both the budget and timetable were met. Success was measured with quantitative and qualitative data. Quantitative measurement included media and social impressions, as well as the volume of volunteers and partnership organizations. Qualitative data analysis included tone and sentiment of news coverage and social buzz, as well as community interest. Coverage was 100 percent positive in tone, with 95 percent share of voice. Social buzz was also positive in tone, and precisely targeted to relevant audiences within the Denver-area. Social impressions on the day of service reached 2,065,856. From Nov. 15 – Dec. 31, 2016, the total news impressions equaled to 7,759,142. The results are incredible considering the limited timeframe, and that a newswire release was not utilized, all coverage was original, reporter-generated content in one DMA. All major local print and television outlets covered the volunteer service project. Volunteers, local artists, organization leaders and the Blue Moon brewmaster were interviewed by the various outlets. Print features included The Denver Post, the city’s leading daily newspaper, and Westword, a weekly alternative newspaper targeting millennials. Television coverage included news packages on from ABC 7, 9 News (NBC), and FOX 31. Key messages and facts in coverage were consistent and accurate. The campaign also drove interest and support. Additionally, the social media charity campaign resulted in a $20,000 donation from Blue Moon to support community art projects. All news coverage and social reach were earned through deliberate public relations efforts. The target audience effect was measured by the overwhelming support Blue Moon received by volunteers, community members, and local officials. “Mosaics for Change” was an immense success. Volunteer registration for the mural creation exceeded capacity well prior to the deadline. More than 100 volunteers picked up their paintbrushes and beautified the 38th Street underpass near the RiNo light rail stop. Local artist Pat Milbery was commissioned to collaborate on the design, which was inspired by Colorado’s blue skies and Blue Moon’s brand colors. Drivers passing by honked their horns and yelled out “thank you” in appreciation of volunteers as they painted the mural. The project not only enhanced the brand’s image, but made the underpass safer and beautiful. The intrinsic value of the campaign will have a longstanding impact in the community. The creative mural helped beautify the community, the lighting made the area safer, and the volunteer project brought the community together in a meaningful way. Overall, Blue Moon’s brand reputation and value was enhanced in the RiNo area. Ultimately, the campaign drove community members to take action and experience positive engagement with Blue Moon. The success of Mosaics for Change motivated Blue Moon to expand the campaign to additional U.S. cities in 2017 and 2018. 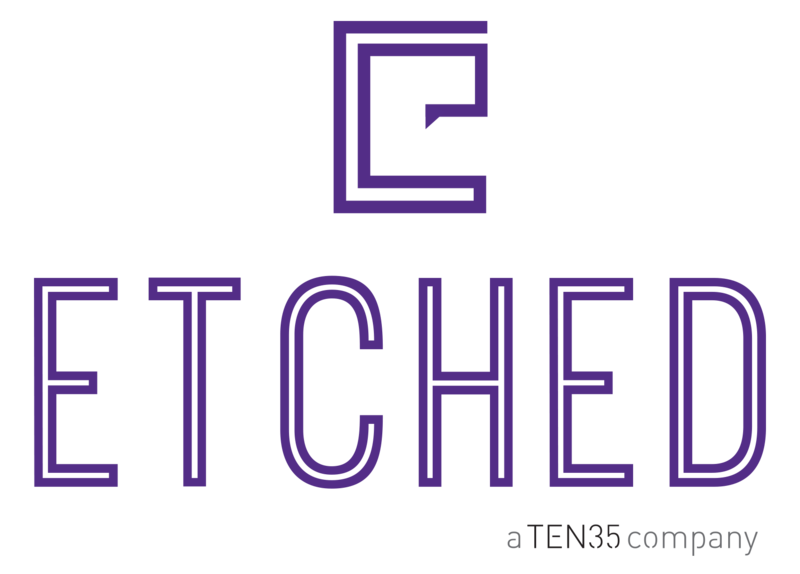 Etched has been retained to manage all campaign components.